When grocery shopping for your family, do you pay attention to where your food is coming from? Is it important to you to buy your food from local producers? With my son’s severe food allergies, I pay close attention to the products I buy for our family. Not only do I look for indications of cross-contamination for his allergies but I look at where the food is coming from. If a product isn’t labeled well, I simply don’t buy it. When buying chicken, I feel confident buying a product with the “Raised By A Canadian Farmer” logo because I know the chicken was raised according to a strong set of criteria. I’m not alone in this thinking – according to quantitative research by Ledger Marketing (commissioned by Chicken Farmers of Canada), 88% of Canadians would be likely to buy chicken if it had a label showing whether it was from Canada or imported from elsewhere. Making fresh, nutritious and delicious choices is a priority for me when planning our family meals. My husband and I haven’t always been the healthiest eaters but our eating habits changed once we became parents. I always made the healthiest choices for my son while I still grabbed something simply quick but not as nutritious for myself. After a health scare with my husband last year, we’ve made a lot of changes to our diets. When you buy chicken with the “Raised By A Canadian Farmer” logo, you know that they were raised to a nationally-set, high food safety and animal care standards. The On-Farm Food Safety Assurance Program emphasizes animal health, cleanliness and safety throughout each step of the production cycle. You can confidently buy chicken with the “Raised By A Canadian Farmer” logo knowing that they have been raised according to a program fully recognized by the federal government. Look for this mark when shopping for your chicken. If you don’t see it, you can approach your store’s manager to ask for help in locating it. My husband loves almost every meal he tries but he wasn’t a big fan of chili until he tasted my recipe. 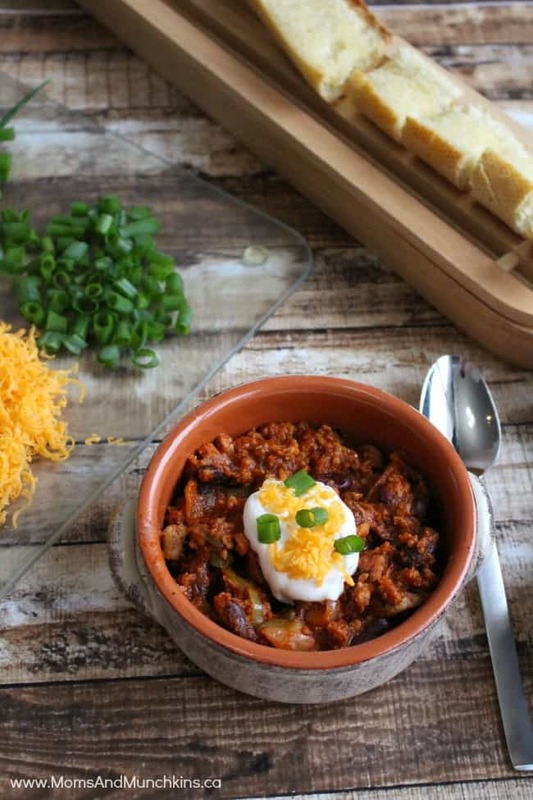 This chicken chili makes a tasty meal on a cold day. 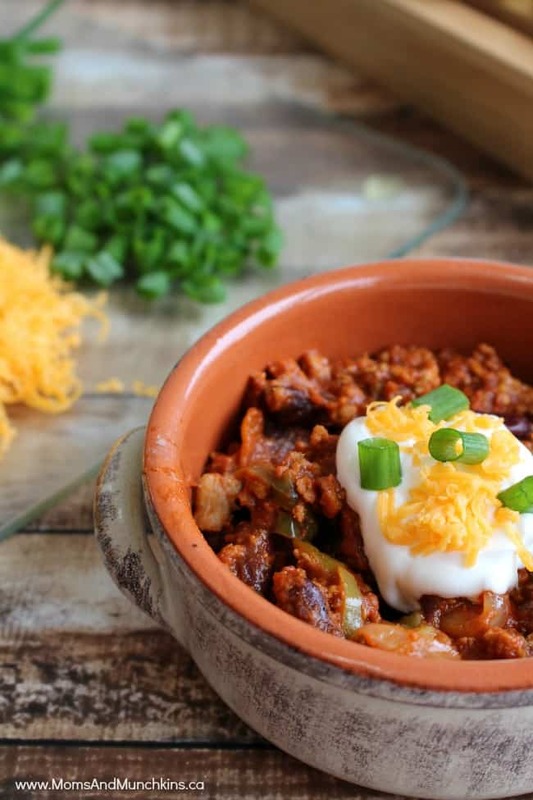 This chicken chili recipe freezes really well so make a big batch for quick & easy dinners! In a frying pan, cook chicken thoroughly (until browned). In a large pot, add crushed tomatoes, chili powder, garlic, beans, celery, mushrooms, green pepper and onion and stir well to mix. Set on stove top over low-medium heat. Add cooked ground chicken and simmer for 1 hour (with the lid on the pot). Serve with sour cream, green onions and shredded cheese on top. Don’t forget the garlic bread for dipping! Have you downloaded the Shopping With Chicken.ca app yet? It’s a great way to organize your grocery list before you get to the store so you don’t miss any ingredients for your weekly meals. I always read labels too! The chili looks amazing. Thanks for sharing!